Do you perspire under & between the breasts? Wear Pambra’s under your bra, and it will keep your skin drier, prevent chafing and irritation, and prevent wetness from seeping into brassieres and clothing. This clever bra liner is also comfortable and inconspicuous, and adds comfort to underwire bras! Pambra’s easily tuck into the bottom of any bra, encircling the body half-way around. See demonstration video at the bottom of this page. Pambra’s is designed with a blended cotton/poly fabric and 100% cotton inside. This soft combination, while allowing the moisture to be trapped inside the liner helps keep your skin dry and keep you comfortable. 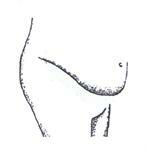 Pambra’s also have a fabric “stem” that rises a short distance between the breasts to give extra absorption. Pambra’s come in five sizes (S through XXL). Note: The XXL size is big enough for anyone, the manufacturer says. 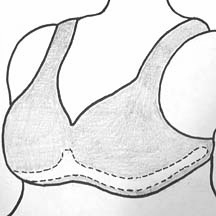 Historical note: We have carried this product for many years, and it used to be made with two “stem” lengths: the “regular stem” for women with cleavage whose breasts contact each other, and a “short stem” for women with little cleavage. Now, there is only one stem length, which can be used by all women. Simply the best bra liner available anywhere. Supplied in packages of three — all of one color. Available colors: White, Beige, or Black. Made in USA.